Now it's easy and entertaining to celebrate the chronologies of your life. Most of us enjoy watching our car's odometer cycle past interesting numeric patterns. For example, watching your car's odometer change from 99,999.9 to 100,000.0 is a significant event in the life of your car. Similarly we measure our lives by the years that pass. Some years are more significant to celebrate than others. But there are other significant numeric patterns in the chronology of our lives that would be fun to celebrate if only we could easily see when they are coming. For example, celebrating as you pass your billion-second mark might be more entertaining than celebrating a rather uninteresting 32nd birthday...and it happens just a few month before. 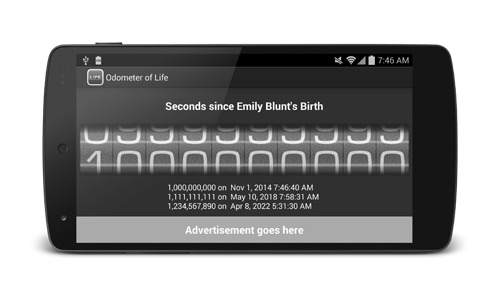 Odometer of Life makes it easy to see and be notified about these interesting cycles in your life for many fun time intervals (like seconds, minutes, ...dog years, ...Martian years, etc.) and for as many time events as you would like. A car's odometer measures only miles OR kilometers, but not both. And a car only measures from it's creation. 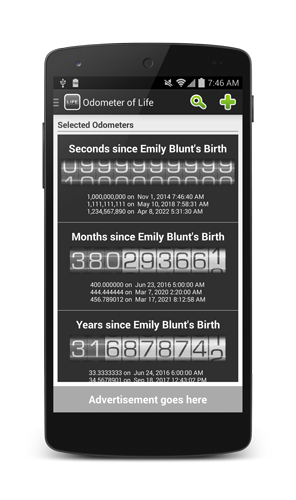 Odometer of Life can measure in many time intervals from many events in your life.